There was a time when the term "Irish-American music" conjured up images of maudlin sentiment, shamrocks, and leaping leprechauns. The "stage-Irish" American pop of Chancy Olcott, George M. Cohan, and other early 20th Century Tin Pan Alley tunesmiths may have helped immigrants assimilate into the American mainstream, but left many with the impression that Irish-American music had little to do with anything genuinely Irish. In fact, traditional Irish music was tenderly preserved and nurtured throughout America, particularly in its cities; often more so than it was back home, as immigrants felt more acutely the need to preserve their culture in this strange new home. A new generation of Irish-American musicians, expertly trained by tradition's best teachers but determined to honor all the music swirling inside them, is helping to maintain the purity of the tradition at the same time they are re-invigorating it. Among the instrumentalists are the likes of Seamus Egan, Eileen Ivers, Liz Carroll, Joannie Madden, and step dancers Michael Flatley and Jean Butler of Riverdance fame. In the vanguard of vocalists is Cathie Ryan, for more than seven years a singer with the renowned women's ensemble Cherish the Ladies, and now staking out a solo career with the release of her premiere Shanachie CD, Cathie Ryan. Despite growing up in Detroit, the traditional Irish influences around which she grew up are heady enough to make a folklorist genuflect. Ryan's parents were both from Ireland; she from Kerry, he from Tipperary. She worked at a bank, he on the line at General Motors. Her father was in demand as a singer at the Gaelic League and Irish-American club. His mother, a fine musician and singer herself, had a profound impact on her granddaughter. They both made sure young Cathie took her singing and Irish music very seriously. As Ryan grew, her achingly clear soprano honored all the influences around her. She is expert at the ancient art of sean nos, unaccompanied singing, and its traces can be heard in her delicate trilling and subtle ornamentation. Listen closely, though, and you'll hear more of Detroit, in a soft country-crack underlining a tender lyric, a plaintive bluesy moan aching through a lonely line, and the driving R&B groove of her merry quick step numbers. "My father sung the big ballads," Ryan recalls. "He was a great one for telling me how to interpret a song; he'd go into great length about the history behind a song, the social world and feelings of the characters in the song. I can't underestimate the value of that. And my grandmother was a lovely singer. She took such joy in singing and playing the fiddle. I loved to listen to her." Cathie's father, along with her mother, also taught her the value of choosing the right song, of looking for a good melody and a story with some power, be it happy or sad. But much of her keen ear for lyrics came from her mother's side of the family, where she came under the spell of the shanachie, the ancient bardic tradition of storytelling, and that love of words--their meaning and their music--can be heard in her crisp, gorgeously articulated phrasing. "My grandfather Rice was a big, six-foot-seven man, and he would take off his cap and tell stories and lilt and dance," Ryan says. He'd get up with his hobnail boots and dance around the kitchen, and he had a great, very distinctive lilt. It wasn't 'diddlie idle doodle dum,' it was 'clanga dinga dang bang.' You know, very rough and full of consonants, nothing smooth about it. He was great. He loved the history of Ireland and the mythology of Ireland, he thought it was crucial to carry that on. He really encouraged me to sing historical songs. He was very into the bardic tradition, that you are the carrier of the history of the country, and the emotion of the country, and that's what you put forth in song. I got that from him." For as long as she can remember, the family's eyes turned toward Cathie to carry on the singing tradition. From the age of seven, she was a popular fixture at Gaelic League sesiuns. She learned the rudiments of sean nos, competing in the difficult and prestigious All-Ireland competitions. After moving to New York, she began to study with legendary sean nos singer Joe Heaney. "Joe believe in courting a song," Ryan says, "that you must have a song for three months before you sing it. You should never sing a song that you don't know well, so that you have an intimate connection to it and can feel more of it. It's disrepectful to the song and to you. He has a real spiritual approach to siging. And that I keep; the few times I've departed from that philosophy I've been disappointed. It's got to be in before you can put it out." Ryan says she loves the haunting, timeless quality of sean nos singing. "It's fathomless," she says. "I think what I love is the same thing that makes me love instrumental Irish music. I hear the way a musician plays a jig or reel, see the way a dancer steps a step, and the way a sean nos singer sings is very much the same. The approach to the ornamentaion and respect for the framework is the same. It's like manuscript art; you can do so much within that frame, so many twists and bends, but you can't leave the frame. It creates this great artistic tension." Like all great teachers, however, Heaney urged her to honor all the music that is within her. She brings the sean nos style to her contemporary and traditional singing, but also strains of the other music she heard on the streets around her. Her best friend's parents were from Appalachia, and great country music fans. So once she left the little bit of Ireland that was home, she listened to Patsy Cline, Hank Williams and Merle Haggard. Evenutally, her mother added Jim Reeves and Johnny Cash to the traditional music on the home turntable. And all round her during the turbulent sixties were the burgeoning sounds of Motown, the deep traditional blues that came to the northern cities from the rural south, and its big city sister, rhythm and blues. That African-American influence can be heard in the beguiling groove of many of her quicker numbers, and in her complex, undulating bodhran playing. "That was a problem in Cherish the Ladies," Ryan says laughing. "Because my rhythm was always funky; they wanted a more straight-ahead one-two, one-two on the reels. I can't do that; I grew up in Motown!" Ryan gained international attention when she was invited to sing with the renowned women's ensemble Cherish the Ladies. Ensemble director and flutist Joanie Madden had heard Ryan sing at a party and asked her to join the group. 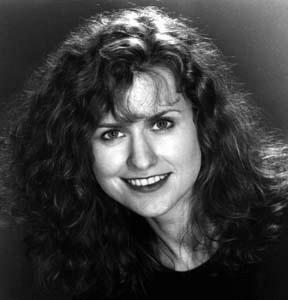 As lead vocalist, she moved easily from sean nos to English language Irish songs, to her own compelling compositions. Her moving paean to Irish immigrants,"The Back Door," is the title song for Cherish's second album, and has already become an Irish standard. Cathie's contribution to the group not only helped to prove that Irish traditional music thrives on this side of the pond, but established once and for all the enormously important role women have played in preserving this music. "When I was a kid growing up and looked at the big stage at a concert of festival, it was always men up there," Ryan says. "To be on a big festival stage, and look down and see little kids on the ground looking up and seeing us, I thought, 'This is a good thing. This is an important thing for people to see.' I think as women we made an important statement by showing not only that we could play as well as the men, but that we could handle the road and be strong entertainers. Then, after awhile, our being women didn't matter; we were just musicians." After seven years with Cherish the Ladies, Ryan decided it was time to be true to her own song. She brilliantly begins her solo career with her self-titled Shanachie debut. It offers a sweet, savvy mix of traditional gems, contemporary songs by cutting-edge folk songwriters including Dougie MacLean, Gerry O'Beirne and Sean Tyrrell, and of course, her own sure, wise and pretty originals. Her girlhood comes alive in the soft, sad "When Detroit was Burning," all the more powerful for refusing to tie up uneasy truths in neat platitudes. Likewise, the haunting, lovely "Eveline," inspired by the James Joyce story, is as powerful for what it does not say as for what it does. "I describe my music as coming from an Irish-American experience," Ryan says. "I was raised by Irish parents, in an American city setting, and my music comes from that, from all of that. But I always thought you had to do one or the other; you were either an American singer or you were an Irish singer. It has taken time to understand that I can be both. I just sing what's in me."